Fall is a great time to take soil samples and test the soil to see where the nutrient levels are. The results of soil tests can help make critical management decisions for the next growing season. Soil testing starts with the soil sample. 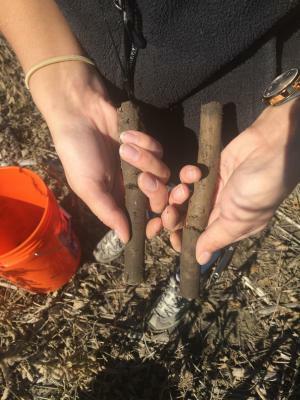 The small sample of soil collected serves as the basis for the lab analysis and ultimately will be used to interpret the soil test results and make recommendations, which is why taking a collection of a representative cores to make a sample is very important. 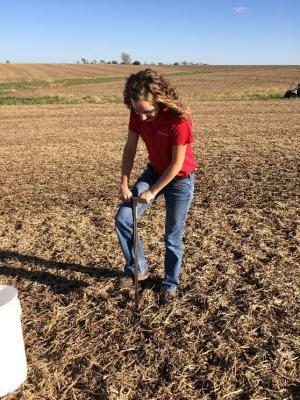 Even if you hire someone to soil sample your fields, it is still equally as important to understand the basics behind the soil sampling procedure. It can help you know what questions to ask or what to look for when hiring someone to take your soil samples. 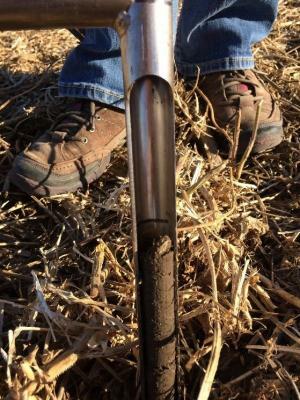 Soil sampling is most often either done in the fall after harvest or in the spring prior to field work but should always be done prior to applying fertilizer. It is important to be consistent in the timing of soil sampling (i.e. always in the fall or always in the spring). Samples should be taken every 2 to 4 years or once in a crop rotation. Fields should be in the same crop each time when sampled to help reduce variability of test results. What soil sampling method should I use? Whole field sampling- Collect a small number of samples to represent the whole field. Typically not recommended because you are not able to capture field variability. Grid sampling - Field broken into square grids (1.1 acre to 10 acre grids) and a sample represents a grid. Management zone sampling - Field separated into management zones for soil sampling based on a combination of prior experience, field history, soil survey maps, yield maps, topography...etc. Whatever method you decide to use, each sample should be a composite of a minimum of 10 to 15 cores. Additionally, it is ideal that a sample should not represent more than approximately 10 acres, unless available information suggests larger field areas have little variation, such as in soil type or yield potential. Multiple sampling areas per field help to determine if a uniform application rate or a variable or site-specific application rate for fertilizer, manure, or lime is more suitable. Cores should be taken from a combination of locations--in the row, between the row, mid-way between the row and not just in one small radius. This is especially important if fertilizer or manure was banded. Samples should represent the sample area/zone as completely as possible. Knowledge of the field history is important in choosing soil sample areas and understanding soil test results. Soil has a long memory, and past management can greatly influence what we see today. For instance, around old feedlots it is not uncommon to see high phosphorus and potassium levels. Why? When manure was hauled it wasn't commonly hauled to the corners of the field, but the area closest to the feedlot. Having a general plan of attack prior to heading out to the field is helpful; this plan would include a map of areas to sample, an idea of how many samples to take, and a plan for how to collect the samples. Within each sample area, pull 10 to 15 cores to make a composite sample. Core should be taken to a six inch depth. ISU Extension phosphorus and potassium fertilizer recommendations are calibrated on a six inch sampling depth. Liming decisions are also make for these samples, but application rates should be adjust for expected depth of incorporation. Take 10 -15 soil cores to make a composite sample. Cores should be representative of the sampling area. Helpful tip: Draw a line at 6 inches on your soil probe to help you stay consistent with the depth when pulling cores. 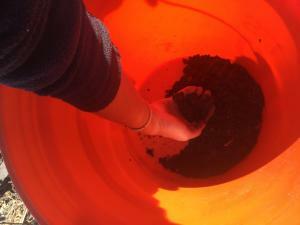 Thoroughly mix the cores in the plastic bucket to make a composite soil sample. 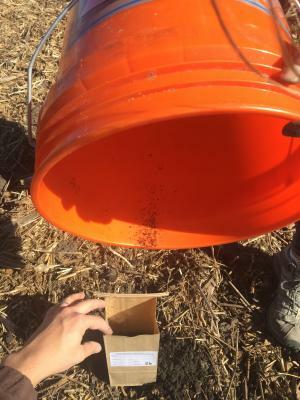 Pour the soil into a soil sampling bag. Label the bags as you go. As you sample, if a core pulls differently or does not look like the other cores in the area, discard that core and pull a different done. The photo below shows two cores that were taken from the same sampling area. The core on the right pulled differently and looked different than the other cores. It was discarded. What should I test my soils for? So what exactly do you need to test your soils for? We want to be able to use the soil test results to make fertilizer decisions - particularly phosphorus (P) and potassium (K), and lime (pH and buffer pH). The organic matter (OM) can be an indicator for some nutrients such as sulfur –if a soil has more than 3% organic matter, sulfur deficiency issues are generally not an issue. Additional tests can be completed but will add to the cost. What lab should samples be submitted to? Typically if you hire someone to soil sample your field(s), they will send it to a lab they work closely with. It is very important to make sure that the soil samples are being sent to a certified lab. You can check and see if the lab your samples are submitted to is a certified lab for the state of Iowa. 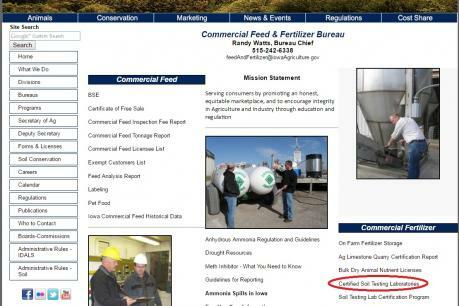 Go to the Iowa Department of Agriculture and Land Stewardship Commercial Feed & Fertilizer Bureau webpage (http://www.iowaagriculture.gov/feedandfertilizer.asp) and select Certified Soil Testing Laboratories on the right-hand side. A certified lab will always report results in ppm (parts per million) and not lb/acre! How do I interpret the soil test results? The Iowa State University Extension and Outreach document PM1688: A General Guide for Crop Nutrient and Limestone Recommendations in Iowa is a resource for interpreting soil test results for Iowa soils. This document provides nutrient application recommendations for phosphorus (P), potassium (K), zinc (Zn), and lime, based on the 6-inch soil sampling depth. The interpretations and recommendations are based on long-term and short-term field experiments across the state. If you have any questions on soil sampling don't hesitate to contact your local extension field agronomist!